Warehouse & Office Lockers | QMH Inc. When you run a large facility with multiple employees on the floor, it is important to provide reliable metal warehouse lockers that offer both maximum space and security. We carry a variety of warehouse and office lockers to ensure you find the perfect locker solution for your facility and employees. If you need accessories configured specifically to match your site’s needs, we can accommodate you. All of our warehouse lockers are constructed form durable steel with welded doors and frames, which provides a rigid, one-piece structure. Doors are made with louvers for ventilation without risking any security. Secure options available include front closed bases for a flush and finished appearance, or combination and manual locking options that offer tamper-proof security. Depending on your space needs and number of lockers needed, we carry single tier tall, double tier, and box lockers that come 1- to 3-wide with 6 tier lockers. 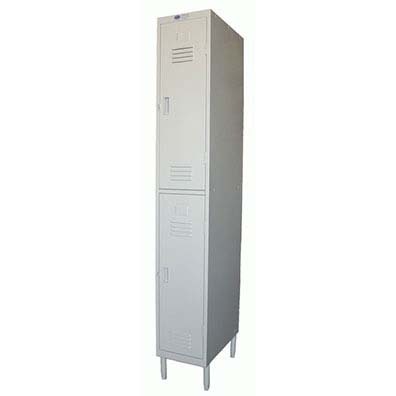 Lockers come in multiple colors, including sand and medium gray. Please call about other color options desired.